First off a quick catch up of where I’m upto.with Monkey. In short I’ve been of the day job for good month now with a serious illness. This meant I missed 7 Hills and didn’t get to run Mandate of Heaven 🙁 I took a couple of weeks to get over the illness, during which time I worked on a couple of D101 things which were at final layout stage (OpenQuest Refreshed and Life and Death for Crypts and Things). After working week in week out on Monkey since before Chirstmas I took a break from it for a good three weeks. Once the brain fog lifted as a my illness subsided and I felt like doing something a bit more mentally demanding my Monkey Mojo returned quite quickly. The Quick Start Rules + adventure is done and just needs proofing+ layout before it hopefully makes its debut as a cute 60-page book at UK Games Expo and as a free pdf worldwide 🙂 We also have demo space on the stall this year, so feel free to rock up go “ook! ook!” and demand a quick demo of the game (about 30 mins to an hour) or a longer 3 hour game in the afternoon. The main book is almost done too, with the stretch goals of The Defenders of the Dragon Empire Chapter and the solo adventure yet to be done. 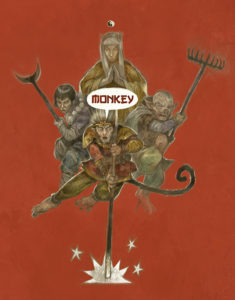 The former is how to run Wuxia heroes in the world of Monkey, defending their home city against the Demons. These two pictures show the in game city creation system, where you draw six cards and each card represents a city district. This models the ancient Chinese system were cities were built on a grid with square districts each having a different function (residential, administration, religious, entertainment etc). The second picture shows the city under demon attack. This is basically an in game adventure generator. 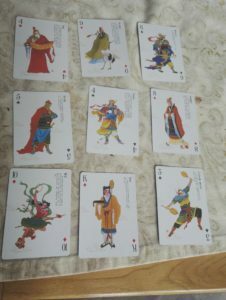 Draw a card for each district. 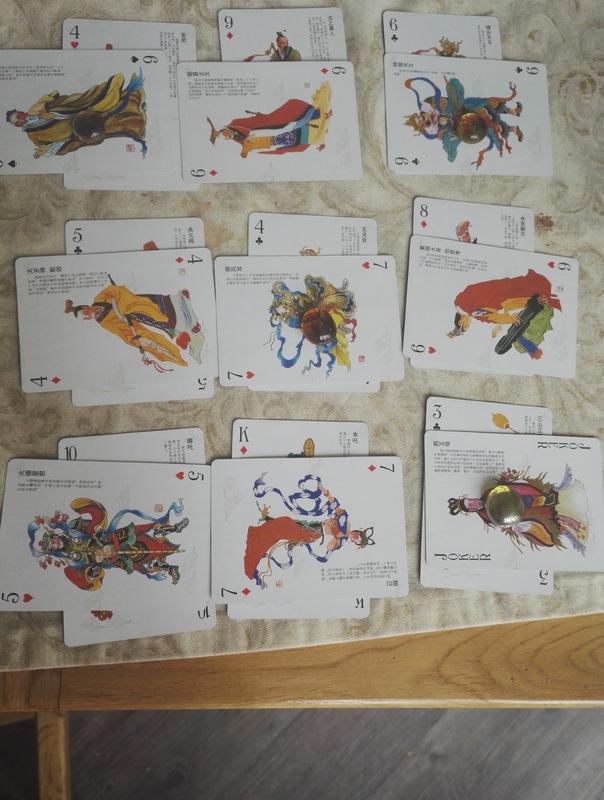 If the value of the attacking card is greater than the district it succumbs to the attack (which I’ve marked here with a glass bead) and will see its value decrease unless the Player Characters intervene and drive the demons off. 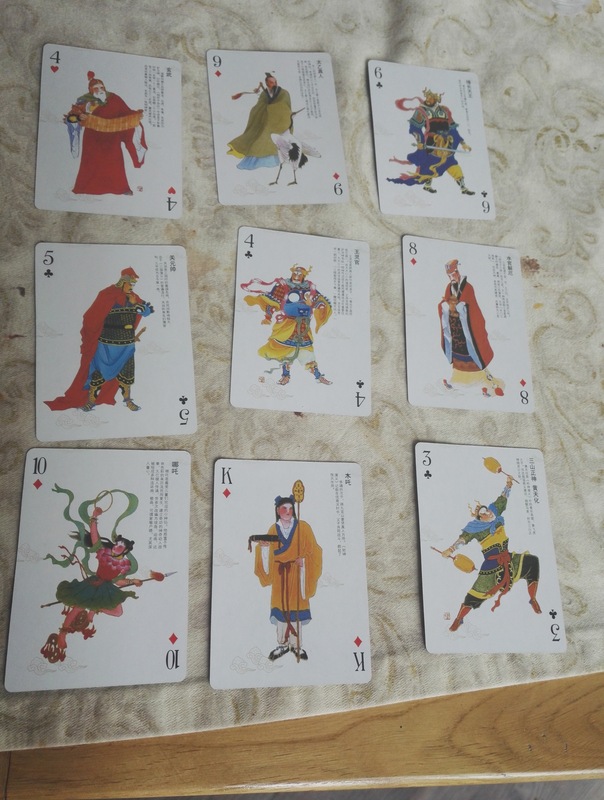 Each suite of card is a different type of attack – corruption, physical, deception etc. Print + free PDF via the D101 Web Store. 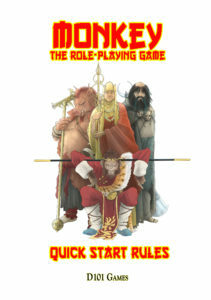 Available now 60 page Free PDF, Quickstart – with short rules, adventure and two sets of pre-made characters.